The new study by the Wyoming Cooperative Fish and Wildlife Research Unit -- a joint program involving U.S. Geological Survey (USGS), the University of Wyoming and the Wyoming Game and Fish Department -- describes a long-term decline in the number of calves produced annually by the Clarks Fork herd, a population of about 4,000 elk whose migrants travel annually between winter ranges near Cody and summer ranges within Yellowstone National Park. Migratory elk experienced a 19 percent depression in rates of pregnancy over the four years of the study and a 70 percent decline in calf production over 21 years of monitoring by the Game and Fish Department, while the elk that did not migrate, known as resident elk, in the same herd experienced high pregnancy and calf production and are expanding their numbers and range into private lands outside of the park. “This is one of North America’s wildest and best-protected landscapes, where elk and other ungulates still retain their long-distance seasonal migrations -- and yet, it is the migratory elk that are struggling while their resident counterparts thrive in the foothills,” says Arthur Middleton, who led this work as a UW doctoral student and is now a postdoctoral fellow at the Yale School of Forestry and Environmental Studies. A key finding of the study was that only 70 percent of migratory elk were pregnant, compared to 90 percent of residents -- a rate more typical of Rocky Mountain elk. The study shows that the hotter and drier summer conditions of the last two decades, coincident with the long-term drought widely affecting the West, have reduced the duration of the spring period when tender new grasses are available to elk. This makes it harder for female migratory elk to find the forage they need to both nurse a calf and breed. Though elk typically bear a calf every year, migratory elk that nursed a calf had only a 23 percent chance of becoming pregnant again in the following year. Another likely cause of the declining calf numbers among migrants was predation. Migrants share their range with four times as many grizzly bears and wolves than resident elk, and both predators are well known to prey on young elk calves. Resident elk get a break from high levels of predation, in part, because when predators kill livestock on the resident range, they are often lethally removed by wildlife managers and ranchers. “A lower pregnancy rate reduces the number of calves that are born in the first place. Predation seems to reduce the number of migratory calves that survive the first few months of life,” says Matthew Kauffman, a research wildlife biologist with the USGS and assistant professor at UW. Kauffman explains that resident elk numbers are growing in the foothills not because migrants are choosing to stay behind, but rather because irrigated fields and lower predator numbers are allowing residents to raise more calves to adulthood. Globally, wildlife migration is a dwindling phenomenon. Research and management often focus on conspicuous barriers like fences, roads and other kinds of development that can physically impede migration corridors. While those are important, this study suggests that even in a landscape as well-protected as the greater Yellowstone ecosystem, subtler changes in predator management and forage quality on the seasonal ranges of migratory animals also will play an important role. Migration is conventionally understood as a strategy to gain better forage quality while also reducing exposure to denning predators but, in this case, it seems those benefits are instead being realized by the residents. The study’s authors note that their work does not predict that migratory elk will disappear, but rather that there could be a long-term shift under way in the relative abundance of migratory versus resident elk in the system. The study also highlights the perils of characterizing Yellowstone wolf reintroduction as a “natural experiment.” Other key factors have changed since wolves were reintroduced, including growth in grizzly bear numbers and recurrent long-term drought associated with reduced snowpack and hotter summers. The authors caution that such factors should be taken into account in the effort to understand ongoing ecological changes in Yellowstone. Middleton also points out that this work highlights the complex challenges facing regional wildlife managers and other stakeholders as they continue to adapt to the reintroduction and recovery of large carnivores, and severe drought that some studies suggest is linked to longer-term climate change. “Most immediately, these trends have meant lost hunting opportunity in the backcountry areas frequented by migratory elk, and increasing crop damage and forage competition with domestic livestock in the front-country areas where resident elk are expanding,” he says. This work was a collaboration among the USGS’s Wyoming Cooperative Fish and Wildlife Research Unit, the Wyoming Game and Fish Department, and the U.S. 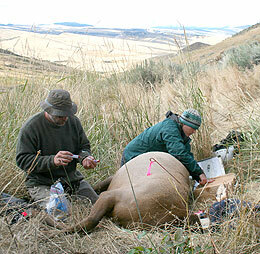 Fish and Wildlife Service, with cooperation from Yellowstone National Park and other agencies. Primary funders include the Game and Fish Department, the Rocky Mountain Elk Foundation, the Wyoming Animal Damage Management Board, the Wyoming Governor’s Big Game License Coalition and USGS, among others. The study is featured in a Forum section of Ecology, with a series of commentaries from other ecologists who study wildlife migration and predator-prey interactions. Funding from the USGS National Climate Change and Wildlife Science Center contributed to this study.